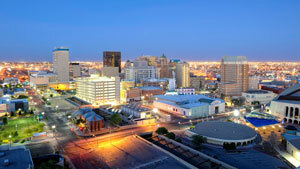 El Paso is nicknamed “El Chuco” and is home to over 600,000 residents. There are many effective advertising opportunities in El Paso including the two sports arenas within the city. Both the Sun Bowl Stadium and the Don Haskins Center can be available for digital signage and other out-of-home advertisements. Target your audience with outdoor advertisements near the El Paso Zoo or the Chamizal National Memorial, two El Paso tourist hotspots. The highways running through El Paso can also be utilized for billboards. Billboards on I-10, U.S. Highway 54, or U.S. Highway 62 would generate high traffic exposure of your business. Zip Codes: 79901, 79902, 79903, 79904, 79905, 79906, 79907, 79908, 79910, 79911, 79912, 79913, 79914, 79915, 79916, 79917, 79918, 79920, 79922, 79923, 79924, 79925, 79926, 79927, 79929, 79930, 79931, 79932, 79934, 79935, 79936, 79937, 79938, 79940, 79941, 79942, 79943, 79944, 79945, 79946, 79947, 79948, 79949, 79950, 79951, 79952, 79953, 79954, 79955, 79958, 79960, 79961, 79966, 79968, 79973, 79974, 79975, 79976, 79977, 79978, 79980, 79982, 79983, 79984, 79985, 79986, 79987, 79988, 79989, 79990, 79991, 79992, 79993, 79994, 79995, 79996, 79997, 79998, 79999, 88510, 88511, 88512, 88513, 88514, 88515, 88516, 88517, 88518, 88519, 88520, 88521, 88523, 88524, 88525, 88526, 88527, 88528, 88529, 88530, 88531, 88532, 88533, 88534, 88535, 88536, 88538, 88539, 88540, 88541, 88542, 88543, 88544, 88545, 88546, 88547, 88548, 88549, 88550, 88553, 88554, 88555, 88556, 88557, 88558, 88559, 88560, 88561, 88562, 88563, 88565, 88566, 88567, 88568, 88569, 88570, 88571, 88572, 88573, 88574, 88575, 88576, 88577, 88578, 88579, 88580, 88581, 88582, 88583, 88584, 88585, 88586, 88587, 88588, 88589, 88590, 88595.